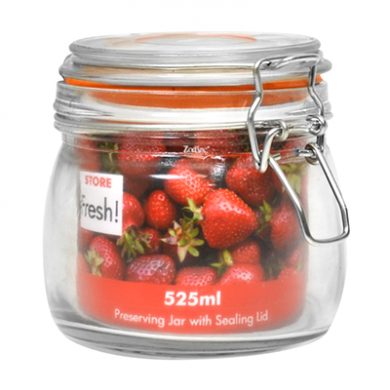 Clip top glass preserving jar with a sealing lid and clip fastening makes it perfect for preserving & serving foods and helps keep your food fresh. 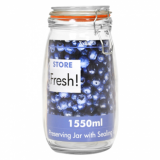 To remove tough stains or grease, pour white vinegar into your jar/carafe and shake well, once removed empty and rinse well. Glass is a sensitive and delicate material which requires good handling and care. 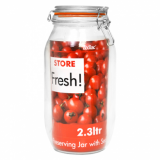 It is recommended that you clean your clip top jar with warm, soapy water and dry immediately. 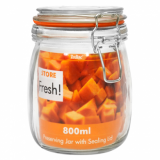 Never store these jars inside each other as this may cause them to stick, leading to fractures and cracks within the structure. It is also strongly recommended that sudden temperature changes are avoided, for example cold water to hot water.